This is how the Sports Field looks before the grading of the ball fields starts. 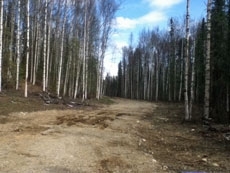 The road was constructed and the field cleared and grubbed using a previous $40K appropriation. The current $195K appropriation is being used to grade the Sports Field, improve the road and construct the ball fields. 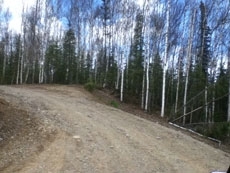 The road was graded using the previous $40K appropriation and is going to be improved with the current $195K appropriation. The community center will be next to the entrance on this cleared piece of land. The Meadow Lakes Community Council is planning both a community center and a gym at this location.